It appears as though celebrities are also being hit hard by the devastating cheating scandal between Kristen Stewart and her Snow White and the Huntsman director Rupert Sanders. Kristen’s longtime boyfriend, Robert Pattinson, is out of the picture, leaving all of the Twilight fans’ lives in shambles –- and Will Ferrell is no exception! Will visited the set of Conan Thursday night to promote his new film, The Campaign, and while Will is usually a barrel of laughs, the comedian was visibly (and hilariously) distraught. 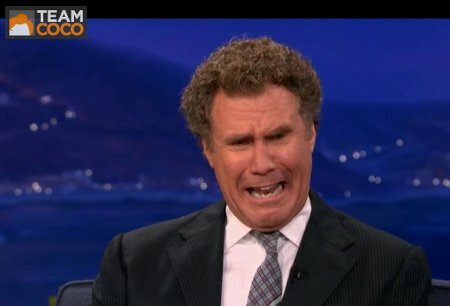 Ferrell, not one to ‘hide’ his emotions, explained to Conan what had him so upset. Poor, poor Will! And I thought I had it bad! I know how you feel though, my friend; it has been quite the shock on us all. Like my friends have done, Conan assured Ferrell that everything would be fine. And like myself, this only further fueled Ferrell’s rage.